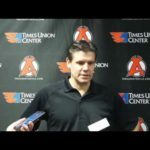 Albany, NY — The Albany Devils, who had the best home record in the AHL a season ago, suffered their first loss at Times Union Center this season. 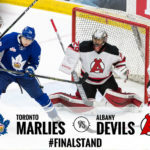 The Toronto Marlies used a pair of first period goals to down the Devils, 3-0, Friday. 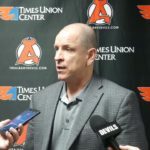 Toronto’s Antoine Bibeau registered his second shutout of the season, finishing with 37 saves. In his second straight start, Scott Wedgewood made 28 stops on 31 tries. 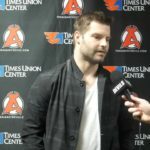 Friday’s game was first meeting between the two clubs since the 2016 North Division Final. 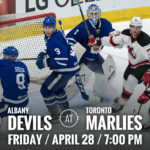 Entering the game, the Devils and the Marlies shared the top spot in the North Division with 5-1-0-0 record. 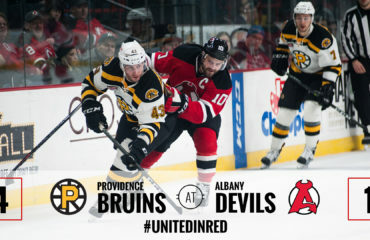 The Devils fell behind early after Colin Greening snuck a shot through Wedgewood’s arm at 5:34 of the first period. Before the intermission, Toronto doubled the lead on the power play. Nikita Sochnikov sent a pass/shot into the slot where Tobias Lindberg redirect the puck into the upper-left corner at 5:34. 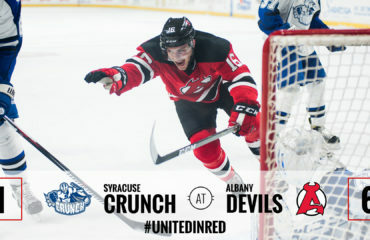 After being outshot 17-5 during the first period, the Devils showed some life in the second. 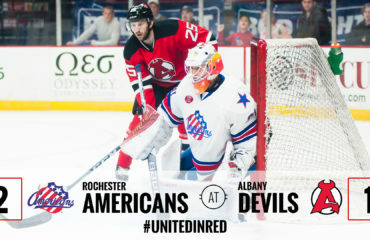 Albany owned a 13-9 shot advantage and despite not finding the back of the net raised the energy when both Seth Helgeson and Blake Coleman dropped the gloves. 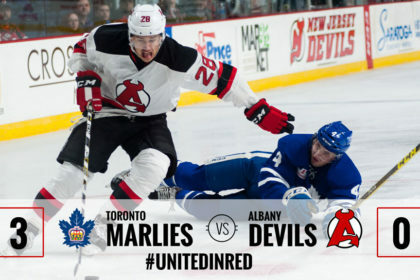 At 10:04 of the third period, a Devils’ miscue deep in their own zone led to Trevor Moore’s unassisted goal to give Toronto a 3-0 lead. 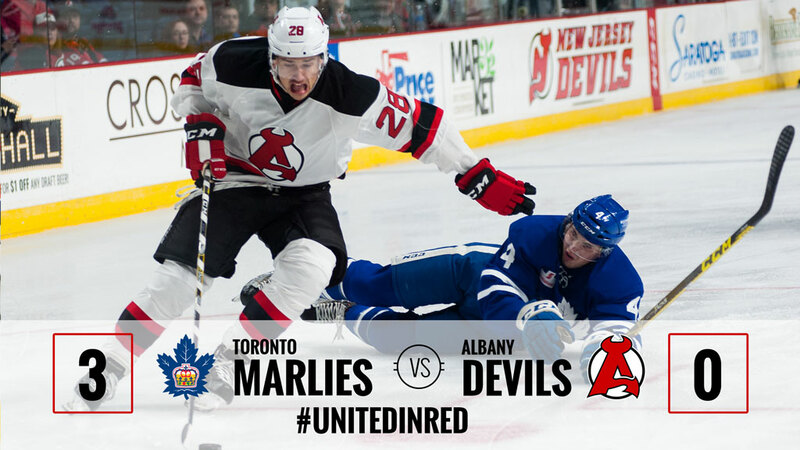 The Devils and Marlies meet again Saturday at Times Union Center at 5 pm.